After two frustrating days in North Carolina the Atlanta-Chicago-Michigan team, coached with admirable sang froid by Vijay Ganji, and captained by Atlanta’s Saqlain, had reason to celebrate today, chasing down the hosts 157/7 for the loss of only three wickets in 18.2 overs. The Midwestern contingent, especially frustrated yesterday, had particular reason to smile as they all contributed to an exemplary run chase, while Arjun Ahuja (2/24) and Ani Mayasandra (2/25) also led the bowling, and Rohit Mogalayapalli reminded everyone yet again of what a fine fielder he is with an excellent slip catch. Heavy rain overnight meant that plans for a very early start at the tiny Crabtree Creek Nature Park ground had to be set aside, while the hosts, aided by some of the visitors, worked on the outfield and the areas around the wicket. By 10.30 the field was ready and TCA captain Prince Patel, on winning the toss, had no hesitation in asking ACM to bowl, no doubt confident that ACM would find the wet ball and the wet outfield challenges. Sure enough, some of the twenty wides and not infrequent full tosses bowled down the leg side by ACM’s spinners had something to do with the conditions, while TCA found themselves again grateful to opener Vidusha, whose 31 might have been even more if Rohit had not taken an excellent diving catch at slip off Ani. Arjun, generating real pace, had already taken two early wickets, keeping the hosts in check. Prince’s captain’s knock and top score for the innings of 36 came to an end when he was clean bowled by Ani, whose bounce and flight again troubled the batsmen; Jaskaran saw off Anup; and Kush, who had not bowled for a year, took two wickets. Thirteen-year-old Akul, given the new ball in tandem with Arjun, rewarded his captain with three tidy overs for twenty, and guest player Svetak’s two overs for 15 also included some excellent balls. Once again, ACM could have been tidier in the field, but when Mith caught Sagar behind off the last ball of the innings for 26 (Kush’s second wicket), the visitors had reason to feel reasonably confident – a target of 158 on such a small ground was far from huge. Two days of batting on the slow Carolina wickets and a day’s acquaintance with the tiny ground also helped ACM, whose innings was opened by a pair very familiar to MCA members – Gordon Makin and Rohit Mogalayapalli. Both reminded spectators of why they had been selected for the USA U-15 side last year with some confident stroke play as they carefully saw off the new ball before Gordon fell lbw for 16 (three fours) with 39 on the board. Rohit was then joined by Ani Mayasandra, and both went after the bad balls aggressively, while playing the good ones straight. By now ACM’s batsmen had realized that a ball hit hard on the ground was likely to head for the short boundaries before the field could react, while shots in the air that would be suicide at Lyon Oaks would be greeted here with enthusiastic applause from team mates as they sailed into the lush Carolina vegetation. Rohit hit three sixes and two fours in his 35, while Ani stood tall, playing back everything he didn’t want to clout, and hitting five sixes in the key ACM innings of 41. When Rohit was clean-bowled and Ani fell lbw, TCA, looking a little crestfallen and sounding less enthusiastic in the field than on previous days, had to deal with Arjun and Kush. The latter was undefeated on 10 (two elegant fours) at the end, while Arjun brought the match to a conclusion with his fourth six, sending the ball over the extra cover boundary to bring his own score to 29 not out. After two disappointing matches, the combined team had found its rhythm and looked a much happier group as they gathered for another lunch generously provided by the welcoming hosts. Alvin Kallicharan praised both teams at the closing ceremony, and much goodwill was generated as parents, coaches, and players mingled before the ACM group made preparations for long journeys home. TCA coach Prashanth and TCA parents take to horticulture at the ground. Wides and Middle-order Collapse Send ACM to 2nd Successive Defeat in N.C. The ad hoc Atlanta-Chicago-Michigan U-17 team, which includes 3 MCA players, went down to a second successive defeat to Triangle Cricket Academy in Morrisville, N.C., today, losing to the hosts by 42 runs at the minuscule Crabtree Creek Nature Park ground. ACM’s Sunny Kumar (Atlanta) starred for the visitors, taking 6/30, including a hat trick, and anchoring the visitors’ reply with a careful 31, but it wasn’t enough, as a massive 40 wides helped the hosts to 179, before ACM faded badly after a solid start, to lose in 30 overs. After both teams had met West Indian great Alvin Kallicharan, currently coaching for and playing in the Triangle Cricket League, in a pre-match presentation, ACM won the toss and put TCA in on a slowly drying field. The hosts made a good start, with twins Vidusha (33) and Nahusha (47) putting on 84 for the first wicket, before ACM’s spinners went to work. Again, dropped catches and a missed run-out made life harder than necessary for the visitors, but TCA found the bounce and flight of Ani (1/33), Sunny, and Saqlain (1/22) difficult, and ACM were reasonably satisfied to bowl the hosts out for 179 on a field where the square boundaries looked about 40 yards from the middle. After the openers, only Samip (29, clean-bowled by Rohit) got into double figures. Sunny’s hat trick (Anup, lbw; Harshmeet clean bowled; and Prit lbw, with the score on 121) looked to have turned the game, but the last three wickets added a valuable 58 runs. Rohit, 2/30 in 5.2 overs was the other wicket-taker for ACM. With an undemanding required run rate, ACM could afford to bat carefully, as openers Mith and Sunny duly did, putting on 42 for the first wicket before Mith was clean-bowled for 15. At that stage, with some eight overs gone, ACM’s supporters had little reason for concern, but disaster followed. Kush looked very comfortable, playing nicely in the V, until Anup’s bounce and turn caught him in two minds and he edged to slip for 9; Arjun then lifted Anup back over the bowler’s head for an apparently effortless six, only to fall clean-bowled to Nahusha on the next legitimate delivery he faced. Rohit was caught behind in the same over, and Gordon came in, took a single off the last ball of the over, then played the first five balls of the following over, from Anup, carefully, only to loop a top edge to point when he tried to cut the last ball of the over. At 68/5 ACM were in big trouble, but there was still hope. Ani began by blocking what was on the stumps, and hit three wide ones for powerful fours, but then played around a straight ball and was bowled. Even at 86/6, victory was not out of question: as the pitch dried, Sunny and Saqlain looked quite comfortable. However, captain Saqlain drove loosely to short extra cover, and Sunny was left with the tail. He fell to a very similar shot with the score on 113, and only a robust 17 from ninth man Jaskaran delayed the inevitable. ACM retired to their hotel to lick their wounds, hoping for some consolation in Sunday’s shortened match, also to be played at the CCN ground. For the Midwestern contingent it was a tough day with the bat, and not an easy day in the field, but it is to be hoped that the experience has been instructive. Pictures below. TCA Coach Prasad with Alvin Kallicharan. MCA’s Gordon behind the stumps, Ani in the gully. Three MCA players were part of the Atlanta-Chicago-Michigan ad hoc U-17 team that lost narrowly to hosts Triangle Cricket Academy on Friday, 21 July, in the first of a three-match series in North Carolina. TCA, chasing 186, won by two wickets with four balls to spare at the Shiloh Cricket Ground in Morrisvile, NC. The series, organized by Atlanta Cricket Academy’s Vijay Ganji and TCA coaches, brought south three MCA players – Ani Mayasandra, Gordon Makin, and Rohit Mogalayapalli – together with Midwest Cricket Academy’s Arjun Ahuja, to play with six Atlantans on a ten-man team. The ACM Captain won the toss and had no hesitation in batting. ACM began well, with openers Sunny and Rohit putting on 54 in a solid first-wicket stand, before Rohit was run out for 22 in the tenth over. Sunny was then bowled for 27 and Gordon for 17, beaten by a ball that cut in and kept low, before Kush and Arjun put together a 51-run fourth-wicket stand. The visitors struggled with the pace of the pitch, failing to punish a lot of short bowling as the ball usually came on to the bat very slowly and often kept low, although some balls did rear up. However, Arjun’s controlled aggression was very effective, his three sixes raising the spirits of his team mates. He fell for 36, caught at square leg, trying to hit a fourth, but finding that he was too early on the shot. Kush’s patient and correct innings came to an end as he was well caught, trying to accelerate, but his 37 was the most valuable contribution to ACM’s innings. The runs dried up in the final overs, despite 13 from Saqlain and a quick ten from Ani, both falling lbw to balls that kept low, and ACM’s innings ended in the 40th over as Akul and Mit were both run out, leaving Karan stranded without facing a ball. ACM supporters on the boundary were left feeling that the total should have been higher – the first seven batsmen had all got into double figures, but no one had gone on to post a big score. Nonetheless, the home team supporters seemed to think that the score was par on a difficult wicket with a rough, slow outfield. TCA’s reply began cautiously, watched by former West Indies Test Batsman Alvin Kallicharan, who coaches Triangle Cricket League’s 200 plus youth players. When the home team were 36/2 after eight overs the visitors had cause for optimism – Arjun had bowled opener Nahusha for 14, and Sunny, who opened the bowling with Karan, had exploited Sagar’s nervousness against the short ball to have him caught at short leg by Kush (one of ACM’s best fielders) without scoring. But a maiden half-century from opening batsman Vidusha (finally bowled for 52 by Arjun) and a solid 42 from Princ, caught very well by Rohit on the extra cover boundary off spinner Saqlain, put the hosts in a winning position. The third-wicket stand of 102 was exactly what the visitors had lacked – a potentially match-winning partnership. Ani, ACM’s unluckiest bowler, saw off Samip, caught for one at short point by Arjun, who, like Kush and Rohit, distinguished himself in the field, but Prit’s innings of 23 (one six), ended by a run-out, brought the hosts within touch of victory. Needing less than a run a ball off the final overs, TCA wobbled a little as Sachin was caught behind by Gordon off Rohit for one, but Dharmik (19 n.o.) brought the hosts home with four balls to spare, ninth man (of ten) Cameron not facing a ball. ACM had entered the match expecting to dominate, but ended the day reflecting on a number of areas that needed improvement: no big partnerships and an inability to deal with the pitch had restricted them to a total that was within reach of the hosts; fielding that could certainly have been better, as several balls that should have gone to hand ended up on the North Carolina grass, while others went through to add easy runs to the hosts’ total, and at least three run-outs were missed; and, finally, in contrast to the good line bowled by TCA, ACM’s bowlers, including the spinners, were often wayward, conceding 28 wides (14 more than the hosts). Arjun (6.2-0-27-2) and Rohit (6-0-21-1) were ACM’s most economical bowlers, while Sunny (8-0-40-1), Ani (8-0-40-1), and Saqlain (8-1-37-1) all returned respectable figures that would have been better had ACM been sharper in the field. A short meeting at the team hotel after the match addressed areas for improvement, but coach Vijay Ganji took the defeat calmly, and observers reflected that some of the shortcomings were typical of a team playing together for the first time. Another forty-over match against TCA awaits today, while back in Michigan Motown-MCA face GDCC at Bloomer Park with an unfamiliar line-up, shorn of its usual MCA contingent. For the third year in a row, MCA members participated in a cricket demonstration last Monday at Traverse City’s Children’s House, during the International Sports Week run at the K-6 school and day care centre’s summer camp. As last year, Gordon Makin helped coach the camp participants, while MCA’s Information Director introduced the sport, showing highlights of the recent ODI series between England and Australia and explaining, with the help of those highlights, the basic elements of the game. The Sports Week was organized by Children’s House parent Tania Santos, who generously hosted the MCA contingent, and forgave them for preferring England’s Test Match team in the forthcoming series to that of South Africa, where she grew up, while Englishman Steve Ursell, of Northwestern Michigan College, provided the local talent. Children’s House P.E. teacher Steve Maas coordinated the event. After the introductory talk 17 children (ages 5-11) were invited to learn some cricketing skills in the school’s impressive gymnasium, and then to play a short match. Steve Ursell captained an England XI, while MCA’s Gordon Makin captained a South Africa XI which included Tania Santos’ eight-year-old son Niklas. The match reached a tense finale, with Gordon’s team triumphing as England’s captain leaked runs to his opposite number. Several Children’s House pupils showed impressive skill with ball and bat, although the ICC might have looked askance at the bowling actions of many. Pictures below. On Thursday MCA’s Ani Mayasandra (LHB, SLA, age 17), Gordon Makin (RHB, WK, 16), and Rohit Mogalayapalli (RHB, RM, 15) will head to Raleigh, North Carolina, where they will join Midwest Cricket Academy’s Arjun Ahuja (RHB, RM, 17) in playing with MCA’s long-time associates from the Atlanta academy in a three-match U-17 series against the Raleigh-Durham Cricket Academy. They were invited to join the Atlantans by Vijay Ganji, one of the organizers of this new series. MCA wishes all four the very best. For updates on this series, check the MCA Twitter feed: @MiCricAcademy. For more information on MCA players, check out the Profiles page. For the second time this season Motown-MCA suffered a frustrating loss to Grand Rapids C. C., this time in the MichCA Forty-overs competition on Saturday, 14 July at Lyon Oaks. In a match shortened to 35 overs because of water from sprinklers on the infield, run-ups, and wicket early in the morning, Motown-MCA scored 235/5 (Vijay Patel 63, Murali 54 n.o., Hari 28, Mani 26 n.o. ), but could not find the penetration to stop Grand Rapids chasing down the score, with Gogi (79 n.o), Bila (45), and Mayank Singh (36) doing most of the damage. Mani’s figures of 2/33 were the best for the home side. Motown-MCA skipper Sathish Thandapani won the toss and had no hesitation in batting, sending in a new opening pair of Vijay Patel and Gordon Makin. They rewarded him with an opening stand of 37, seeing off the (sometimes wayward) new-ball bowling, before Gordon fell in the first over from Athis Patel, caught at first slip off a delivery that moved away. Vijay continued the way he knows best, hitting the ball hard, going over the top when the opportunity arose, and showing no concern for a couple of chances given in the process; no 3 Hari also batted in character – carefully and elegantly, before surprising spectators when stumped off Fahad Ilahi for 28. Captain Sathish Thandapani and one of this year’s new players, Praveen Konada, added a few, but the partnership between Mani and Murali, part of Motown’s Tamil Union, was key in the final overs, as Mani, with one six, was overtaken by Murali, firing on all cylinders for a five-over fifty that contained five sixes and four fours. Motown-MCA’s total seemed around par on a big ground, and GRCC began quite slowly against the first three bowlers, Rohit Mogalayapalli, Murali, and Chamila Kannangara, but seasoned observers on the boundary noted that the new ball would have been better used if pitched up more, and when Motown-MCA’s spinners came on the slow wicket made aggression difficult for the fielding side. Mani engineered an excellent run-out to dismiss the dangerous opener Mayank Singh, after Khursid had been caught behind off Chamila, and Sai fell to Pawan Canchi’s spin, but a fourth-wicket stand of almost 100 between Bila (eventually acrobatically caught by Praveen off Mani) and Gogi made the difference. Joydeep Singh scored a quick 19 before falling to Murali, caught Sathish, while Sravanan added 12 before Mani had him caught by Murali, but it was too little, too late. After the match senior observers remarked that Motown-MCA were clearly a stronger, better team than in previous years, noting that they had competed strongly in every match this season, but that the team seemed to lack a “killer instinct”, and that the younger players needed to learn how to win. It is to be hoped that that lesson will, indeed, be learned in the second half of the season. In his latest Willow Talk column distinguished former first-class cricketer and coach of international players Dr V. V. Giri, who conducts High-performance coaching sessions for MCA, share with Academy members and friends a letter he recently sent to the ICC, calling for a re-think on two of the Playing Conditions for international limited-overs cricket. For more on Dr Giri, check out MCA’s Profiles page. I write to raise with you, concerns I have about two current issues in international limited-overs cricket, and, in one case, to raise with you a possible solution. I have very extensive experience of the game: as a player (at the first-class level for several years, and at the highest club level for several decades; both in my homeland and across the cricketing world); as a coach (in India I coached, among others, future and current international players; in the United States I coach a wide range of club and youth players, including some who have represented the United States at age-level; I have coached many representative sides, most recently in tournaments sanctioned by the American board); as an administrator (I was for several years secretary of the Madras Cricket Club) and as an umpire (I currently stand most weekends in matches of the Michigan Cricket Association and the Great Lakes Cricket Conference). I hope that you will agree that my experience entitles me to claim a profound and wide-ranging understanding of the game, and I urge you to take serious note of the issues I raise – with regard to “foot-fault no balls” in limited-overs cricket and to batsmen changing their guard. I have given considerable thought to these two issues, and see in both potential problems, most likely to occur at decisive moments in international matches. I feel that it is imperative that the ICC act now before such problems present huge challenges to umpires. And, needless to say, what will be a challenge to international umpires will, sooner or later, be a massive obstacle to those charged with officiating and administering the game at the club level all over the world. University of Michigan Hospitals, Ann Arbor, MI, USA. Cricket Player, State Coach, State Selector and Regional Umpire. FREE HIT FOR “FOOT-FAULT NO BALL” IN T20 & ODIs. The batting side got one extra run, plus any runs scored off the bat. The batsman could not be dismissed, except by means of a “run-out”. Since a “no ball” is not a legal delivery, the batting side also got one extra delivery from the same bowler. The present ICC rule for a foot-fault no ball in T 20 and in ODIs issues the same penalties to the bowler and gives the same advantages to the batsman, but, in addition, an extra delivery, called a “Free Hit Delivery”, is granted to the batsman. The batsman cannot be dismissed from that extra delivery, unless, of course, he is run out. In other words, the extra delivery is, essentially, treated in the same way as the foot-fault no ball itself — the bowler cannot dismiss the batsman with that delivery. However, the free-hit delivery is also considered one of the six legitimate deliveries in the over. Here, I am very much concerned about certain points. T20 or ODI matches are played with each side bowling a maximum of 20 or 50 overs, respectively. Each over consists of six legitimate deliveries. That is six deliveries without a ‘wide’ or a ‘no ball’. Thus, the bowler can take a maximum of six wickets in an over (excluding run-outs from wides and no balls, and stumping from wides). However, with the new ‘Free Hit’ rule, the bowler does not get to bowl six legitimate deliveries in an over where he bowls a “foot-fault no ball”. Therefore, it can be argued that the ICC should have either added one more extra delivery (in addition to the free hit delivery), thereby enabling the bowler to bowl six legitimate deliveries, or should have left the original rule standing. I must emphasize that I am not arguing in favor of the bowler, suggesting that batsmen are given undue advantage while bowlers are unduly punished. It is clear that cricket is a batsman’s game, so that bowlers are always at a disadvantage, as is indicated so well in the familiar principle that “The benefit of doubt should go to the batsman”. What I am arguing is that preventing the bowling side from bowling six legal deliveries will lead to complications in terms of Duckworth Lewis and Net Run Rate calculations, where wickets lost count. The bowling side, where “free hits” have been granted, have not had the opportunity to bowl 120 or 300 potentially wicket-taking deliveries in a completed innings. A particularly problematic situation will arrive, sooner or later, when a bowler bowls a no ball on the sixth delivery of the final over of an innings. He would have bowled only 5 legitimate deliveries in that over. After the ‘no ball’ delivery, the bowler is made to bowl the ‘free hit’ delivery and the over ends without the bowler getting a chance to take another wicket. Applying the ‘No Ball’ rule for not more than 5 fielders on the leg side in limited over games. Applying the ‘No Ball’ rule for not more than 2 fielders behind the popping crease on the leg side. To put it bluntly, the current playing conditions and Laws of the game leave a clear opening for what could easily be characterized as cheating and would surely be against the spirit of the game. Again, an extreme situation will surely occur eventually, and create huge problems for everyone involved. Towards the end of an innings – for example, during the last over of a limited-over innings — an incoming genuinely right-handed batsman could arrive at the crease and inform the umpire that he is a left-handed batsman and then take guard accordingly. However, when the bowler begins his run-up, the batsman could switch or change stance and grip, thereby becoming what he “really was” — a right-handed batsman. Not only would the bowler be shocked, but the umpire would face very serious challenges in applying current Laws and playing conditions, while the batting side would surely be preparing to score what would be, essentially, “illegal runs”. I urge you to take serious note of my comments and to address what is clearly a deficiency in current playing conditions. There will be no High-performance Coaching Session this week. For details of the program and pictures of previous sessions, see earlier posts. 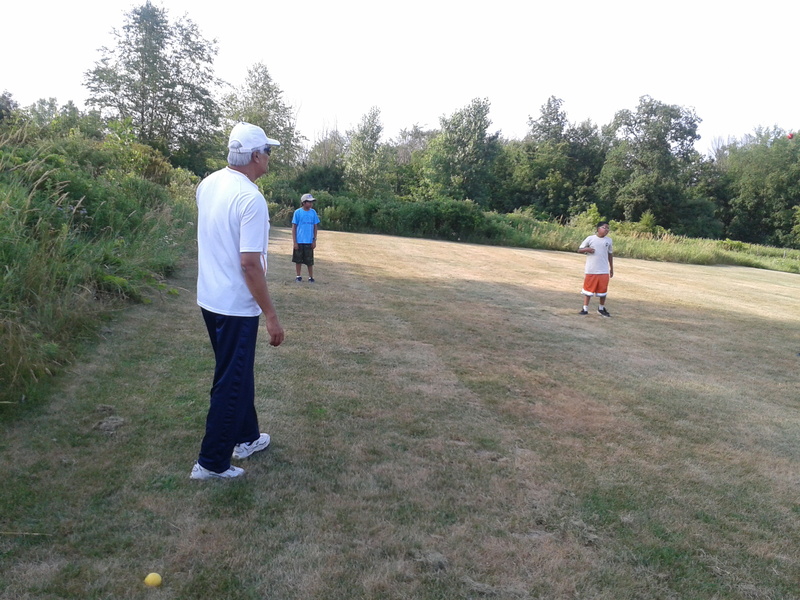 Michigan Cricket Academy will continue its second annual series of high-performance coaching sessions with Dr V. V. Giri, former first-class cricketer with many years of experience of the game around the world, including the coaching of international players, on Wednesday, 11 July at 4 pm at the Lyon Oaks cricket ground (note change of date). In order to ensure individual attention, numbers are very limited. The cost per person per session is $40. For more details, please contact MCA. For more information about Dr V. V. Giri, author of the “Willow Talk” column on this web site, see the MCA Profiles page. The second session took place on Thursday, with work in the nets followed by fielding exercises, as pictured below. MCA is delighted to announce that every Friday in July and August the Academy will run a youth coaching camp at the Lyon Oaks cricket ground in Wixom, beginning at 6 pm. The two-month camp welcomes boys and girls of all ages and levels of cricketing experience (including none). The camp will be supervised by MCA Joint Head Coaches Mr Shyam Mayasandra and Dr Vasanth Krishnaswami, with “hands-on” coaching from members of the Motown C.C. 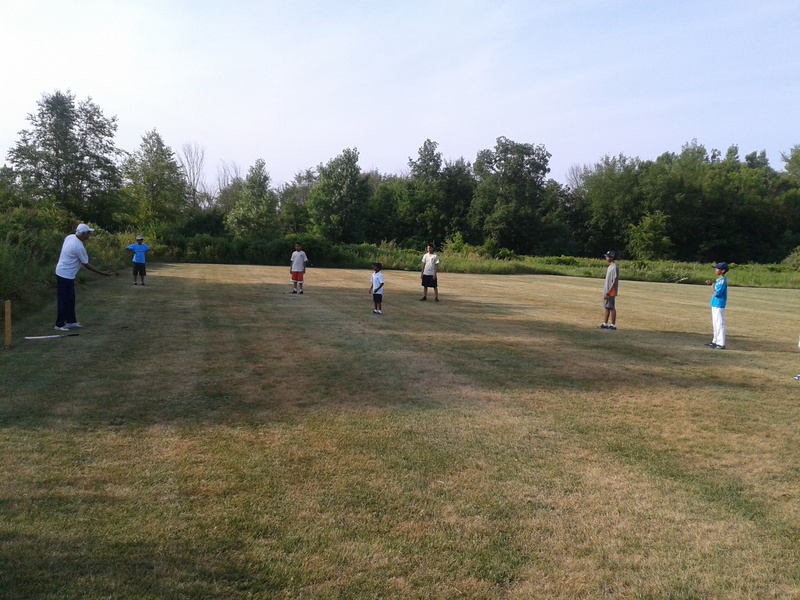 / MCA joint team, currently playing in the Michigan Cricket Association 40-overs competition. It is hoped that the camp will include intramural small-sided matches. All equipment will be provided (although players are welcome to bring their own). 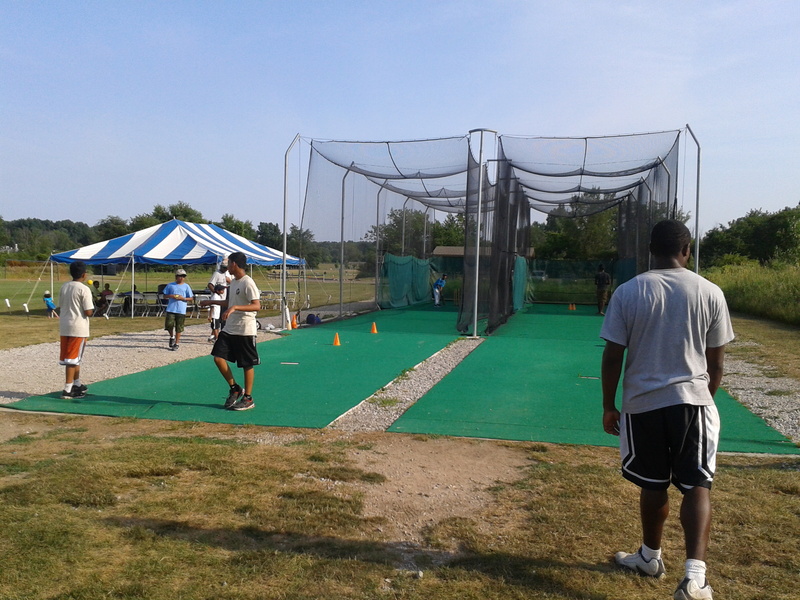 The cost of the two-month camp is $150, with checks payable to “Michigan Cricket Association”. For more information, please contact MCA’s Information Director.